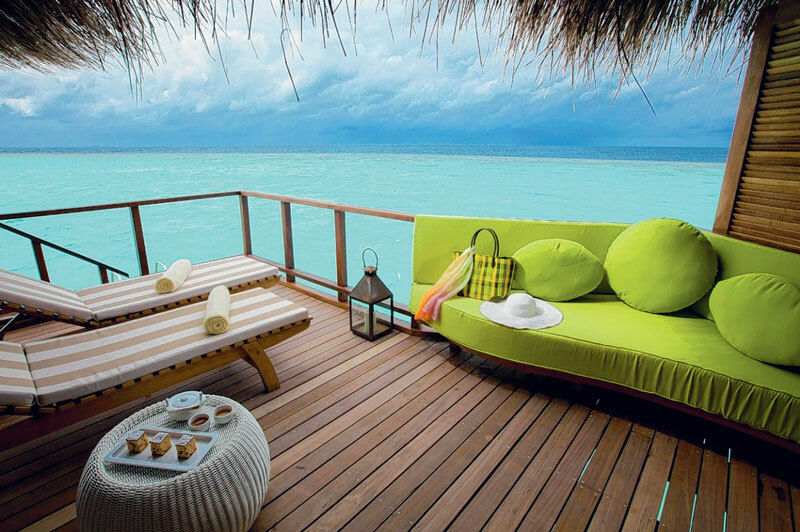 When you think honeymoon romance, you think the Maldives. Sam Wylie Harris discovers a resort where luxury and love are the order of the day. I gingerly take the hand of the cabin crew member helping me down the steps of the twin-engine sea plane to a small pontoon surrounded by calm turquoise water. The glistening white sands and lush vegetation of a small island are finally within my reach. After a 20-minute scenic flight, my husband and I have arrived at our romantic hideaway. About 93km from Male, Maafushivaru (“maaf” means flower and “fushi” island) is on the southern tip of an ancient underwater volcano called the North Ari Atoll. It’s a giant lagoon that’s fringed by reefs and dotted with other remote resorts with similar palm leaf roofs, water villas and ancient Indian banyan trees planted among the coconut palms for shade. A dhoni wooden boat gently glides into view and an outstretched hand welcomes me on board for the briefest of crossings to a wooden walkway. Perched above the reef, it’s the gateway to our romantic island escape. I’d chosen a water villa over a beach bungalow as I loved the idea of staying in a bedroom on stilts and stepping down to swim straight into the sea, with the added privacy of a sunbathing terrace not overlooked by other guests passing by. However, the debate during our welcome cocktail is whether to opt for a “sunrise” or “sunset” villa. With the throw of a dice, we choose the latter and awake to uninterrupted views across the Indian Ocean. Maafushivaru Maldives Resort offers seclusion and luxury for newlyweds wanting to escape it all and honeymoon in tropical bliss. Settling into this unique “one-island, one-resort” concept (there’s no island-hopping in the Maldives) we feel like we’ve joined an elite club where everyone’s friendly, the staff greet you with genuine smiles and where you can simply relax or enjoy some of the best diving and snorkelling sites in the south of the Ari Atoll. 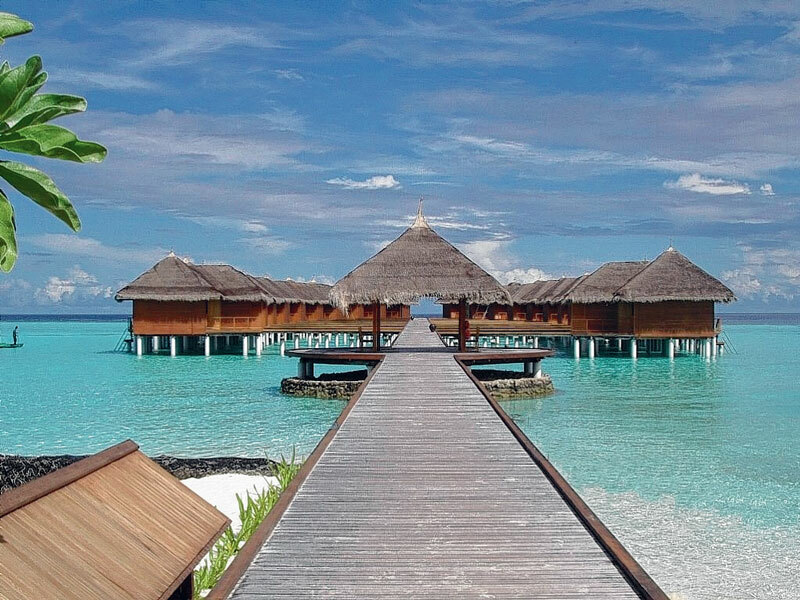 Maafushivaru is an all-inclusive resort with a la carte dining options, 48 villas and a “No shoes. No news” tag-line. Activities can include a sunset cruise to see dolphins, or snorkelling excursions where you can come face to face with turtles, whale sharks and manta rays. What marks Maafushivaru out from other resorts is its smaller neighbouring uninhabited island of Lonubo. Guests can take advantage of a complimentary trip to the idyllic getaway, where they can spend a couple of hours swimming and sunbathing with a picnic (at extra cost). But my husband and I decide to splash out the extra $US1000 ($A1116.32) for a Robinson Crusoe-chic overnight stay. Our adventure begins late afternoon when the dhoni boat drops us off on Lonubo and we stroll barefoot in the sand to our wooden bungalow. We arrive to find an exterior bathroom with a rain-shower, big screen TV, pink frangipani scattered on crisp white bed linen and a bottle of sparkling wine on ice. It doesn’t take long for us to head to the dead calm sea, which is 30 degrees. Waist deep with glasses in hand, we steal a kiss (even though no one is looking) and burrow our toes into the sand. As darkness falls we lounge on the beach bed, play on the oversized sofa-swing and watch clusters of crabs building their evening home in the sand. The dhoni boat returns and a couple of members of staff busy themselves with setting up the barbecue for a menu of grilled fish and lobster, which is served by candlelight. Six metres from our table, another light show captures our attention. Bioluminescent plankton are performing in the sea under a blanket of darkness. Later, alone on the island, we enjoy a peaceful night’s sleep and awake to the sound of blackbirds frolicking in the palm trees. Back at Maafushivaru, we continue the romance with a relaxing 60-minute couples massage in the newly refurbished spa. Set over the water, it offers a menu of body rituals from Indonesia, Thailand and India, and Yon-Ka face and body treatments from France. The plunge pool overlooks the sea with gentle waves lapping beneath the day beds which are shielded from the sun by billowing sails. That evening, after dinner, we sink into giant beanbags and watch clips from David Attenborough’s marine life series, projected onto a large screen. What we’d seen snorkelling by day was being played out at night. Seduced by the flora and fauna of the Maldives, we toast our good fortune at having been cast away at Maafushivaru. On the way back to our room, I notice a beautiful big white flower with petals splayed wide open. During the day, I’m told, it rests, unfurling only as darkness falls. I later discover its name is Queen of the Night, which aptly describes how I felt during my stay on Maafushivaru. Australians usually travel to the Maldives via Singapore or Kuala Lumpur, flying either Singapore Airlines or Malaysia Airlines to Male. A 25-minute sea plane flight takes guests from Male to the Maafushivaru resort. The resort offers special rates and complimentary benefits to honeymoon couples staying at Maafushivaru Maldives for at least four nights and who arrive within six months of their wedding day.